Liz Kessler's New York Times best-selling series continues with the half-mermaid embarking on an icy and perilous journey to the Land of the Midnight Sun. Strange storms are blowing up from the ocean, caused by the nightmares of Neptune, King of the Sea. Convinced that his dreams herald an approaching threat, Neptune enlists half-mermaids Emily Windsnap and Aaron for a top-secret mission to find and eliminate the source of the trouble. But Emily and Aaron quickly get in over their heads in the frigid waters of the frozen north. Deep within an alpine lake where magical reflections show what could be rather than what is, the two discover a trove of stolen memories and Neptune’s darkest secret. Double-crosses and double-takes abound in Liz Kessler’s fifth magical mermaid adventure. Enjoy a lazy Sunday morning then come on by for a fun family event with bestselling author (and kids' favorite) Liz Kessler. Hear from her new book, ask all your burning questions about how she creates the world of Emily Windsnap and, of course, get your books signed! Liz Kessler -- Emily Windsnap and Philippa Fisher! Liz Kessler on tour for Emily Windsnap and the Siren’s Secret. 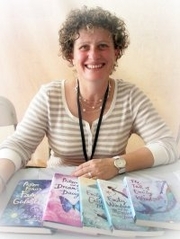 ; Liz Kessler on tour for Philippa Fisher and the Fairy’s Promise. Liz Kessler, The Tail of Emily Windsnap. LIZ KESSLER signs Philippa Fisher and the Dream-Maker’s Daughter. Liz Kessler's book Emily Windsnap and the Pirate Prince is currently available from LibraryThing Early Reviewers. Liz Kessler is currently considered a "single author." If one or more works are by a distinct, homonymous authors, go ahead and split the author. Liz Kessler is composed of 3 names. You can examine and separate out names.